We like to use plastic beads to make play jewelry, but the beads can be used in a number of different ways too. This week we used them for making L’s spelling words. It was a great fine motor skill activity too, as she had to pick up the individual beads in her fingers and place them carefully to make each letter. 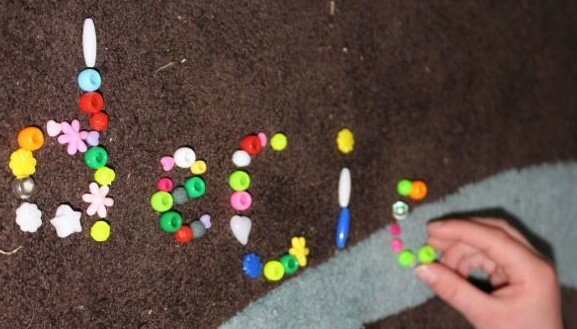 L also did some sorting of the beads, using one colour for a whole letter. The ‘e’ in course is also done in a pattern of white and blue beads. 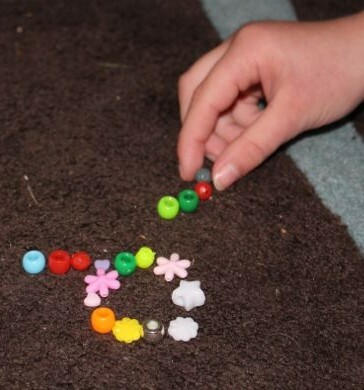 Using these beads for sorting and pattern making will be a fun maths activity for A some time soon.